Quite by chance I recently ate a meal which included kimchi, a Korean dish consisting of fermented vegetables. 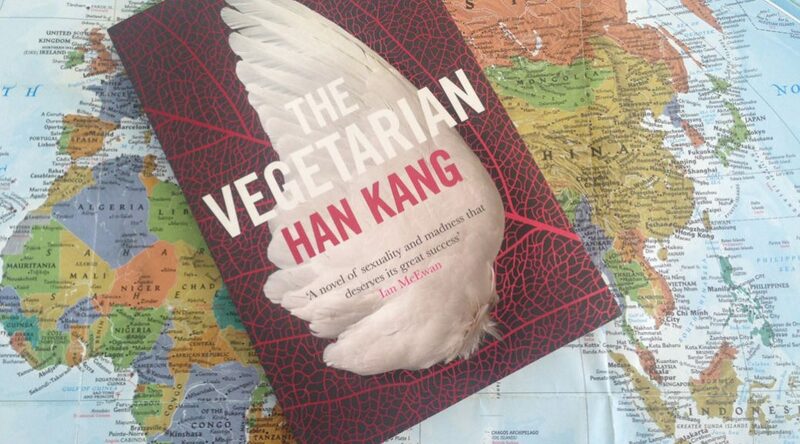 Kimchi also made an appearance in the South Korean book I bought for my reading challenge, The Vegetarian by Han Kang. However, my dish also had pork in it, which would not have passed muster with the book’s title character, Yeong-hye. Even though the title and story centre on Yeong-hye and her decision to stop eating meat, it’s told from three different perspectives, each perspective contained in one act. This three-act structure may sound very traditional, but the vivid physicality pursuing each act (particularly through the inclusion of Yeong-hye’s visceral dreams in the first) push it to another level. This level is ruled by her characters, who take precedence over plot. But when characters are so vividly and complexly drawn as those in The Vegetarian, the story stands to serve them. This intense gaze on her characters draws the story into abstraction and I can’t say I really grasped the deeper themes she pursed in her narrative. But Han’s beautiful yet tragic journey with the characters startles and surprises, compelling you to continue reading. This is the first South Korean book I’ve read, but I’ve had brief encounters with director Park Chan-wook. Years ago I watched his movies Sympathy for Mr. Vengeance, Oldboy, and Lady Vengeance, which together form The Vengeance Trilogy, an intense work of cinematic brilliance. And then there’s his Hollywood outing, Stoker, which is an equally riveting piece of work. My journey with these two artists is not over. Han’s recent works – Human Acts and The White Book – have also been translated into English. Park released The Handmaiden a couple of years ago and I have yet to watch it. But I’m barely scraping the surface. There are still many South Korean writers and directors for me to encounter, but if you’re looking for an introduction, they’re a great place to start.